Here's something that ought to catch Democrats' attention: Swing voters at a recent focus group in Wisconsin hadn't heard of either the Green New Deal or "Medicare for all,"
Why it matters: These are Democrats' biggest policy staples heading into the 2020 presidential election. They're talking about them all the time, and the ideas are even being weaponized by the right to label the entire Democratic Party as socialists. But none of that is breaking through in this key battleground state. This takeaway comes from the Engagious/FPG focus group of swing voters we watched earlier this month, which included eight Barack Obama/Donald Trump voters and four Mitt Romney/Hillary Clinton voters. Details: Not a single person had heard of — or could explain — the Green New Deal. "I would only say that it's an environmental policy because it has the word 'green' in it," said one woman. Nine of the 12 people said they'd heard almost no news at all about "Medicare for all" in the past several months. 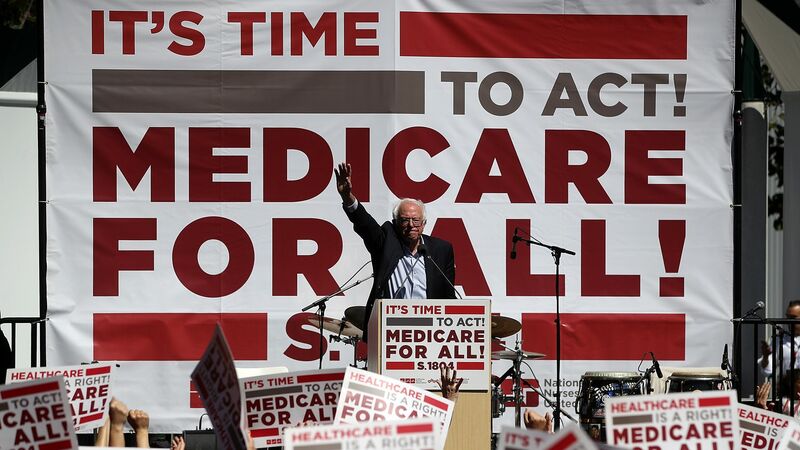 Half of the participants had never even heard the phrase "Medicare for all" until they walked in the room that night in Appleton, Wisconsin. "I think Bernie Sanders has said something about it," said Carla N., a 53-year-old Romney/Clinton voter. A majority of these swing voters have no idea which party is pushing the plan. Because of that, they don't view either the Green New Deal or "Medicare for all" favorably or unfavorably. They're also unfamiliar with most of the 2020 Democratic presidential candidates, as I've written. In fact, these swing voters know Rep. Alexandria Ocasio-Cortez better than all of the 2020 Democrats except for Joe Biden, Elizabeth Warren, and Bernie Sanders. The bottom line: Democrats might have an opportunity to capitalize on Trump fatigue in 2020 in this critical battleground state — but they're a long way from winning over swing voters on the ideas that will define their campaigns.